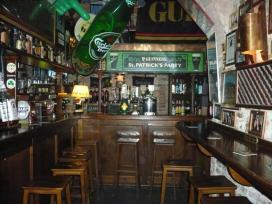 The Shamrock Pub is located opposite the central square of the historic center of Perugia, and has a purely Irish style furnishings. Open daily from 18 pm to 2 am, the pubhas 25 tables, 5 of which are external. The quaint atmosphere of Shamrock and the quality of beer, first of all the Guinness, the famous Irish stout are among the dominant features of the pubs, which records the pricesreally cheap in drinks and beers, but also in typical Umbrian food, as meats, cheesesand even pasta dishes with truffles. Bands play in the lounge music to entertain customers specific days each week caninteract and have fun with karaoke.